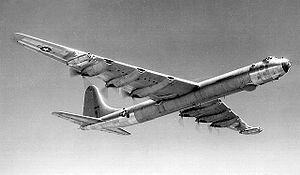 The B-36 Peacemaker was a strategic bomber. It was used in the United States. The B-36 could carry a 21,000 pound bomb. The B-36 was never used in wartime, but was in a movie called Strategic Air Command. The Peacemaker could fly for 48 hours non-stop and was one of the longest ranged bombers at the time. It first flew in 1948, and the last combat flight was in 1959. This page was last changed on 9 March 2015, at 15:36.